A comment from David O’Rourke in the post about the radial line to Sutton drew a response from John F. Bromley who I thank for the information here. It has been edited slightly. 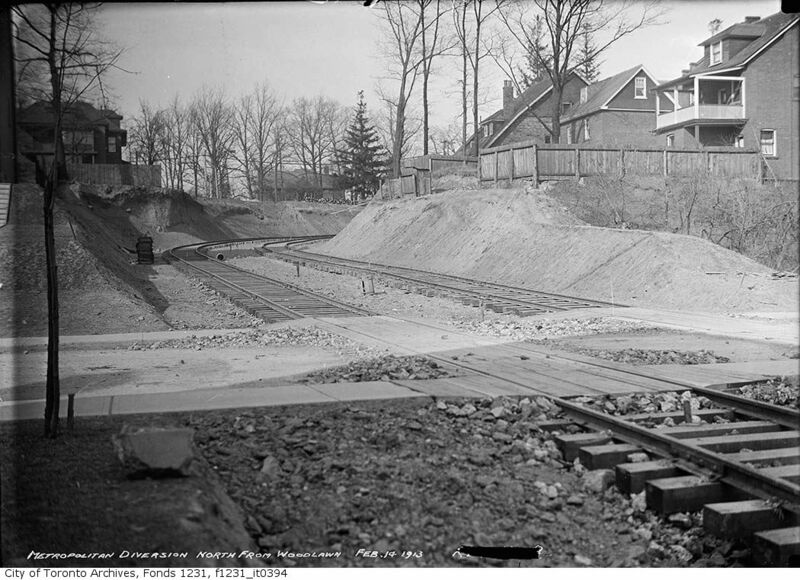 In 1911, North Toronto, not yet part of the City of Toronto, battled with the T&YRR over the railway’s attempt to build a separate private right-of-way for their Metropolitan line, 100 feet west of Yonge Street. The town wanted the line to be double-tracked on the street itself while all the railway wanted was passing sidings. Telegram June 26, 1911 Page 17 (also June 27, page 17): ORB [Ontario Railway Board] decided today to allow Metropolitan PRW deviation south of Farnham. Tely Sept 27, 1911 P5: Metropolitan to get double track through North Toronto, decides North Toronto council “last evening”. T&YRR wants to divert the line to a private right of way 100′ west of Yonge. And, it develops later, T&YRR doesn’t want double track. Star Sept 29, 1911 P9: T&YRR want lengthened sidings, not double track. JFB Note: their reasoning is obvious; they have to pay the town of North Toronto $600 per mile of single track. Star Oct 17, 1911 P7: ORB says Metropolitan may have PRW between Balmoral and Farnham but must depress or elevate their tracks. Toronto World May 24, 1912 PP 1 & 11: Plans for the new North Toronto Station were announced; it will cost $2,000,000. A grade separation project is also announced for North Toronto. 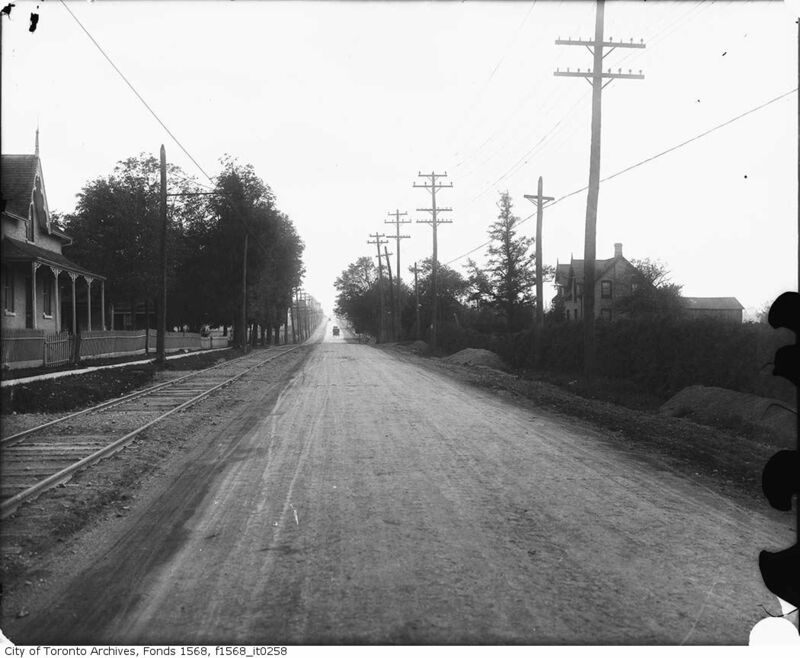 World June 7, 1912 P1: North Toronto is to vote on Saturday, July 6 for or against double track for the Metropolitan line and regarding annexation to the City of Toronto. 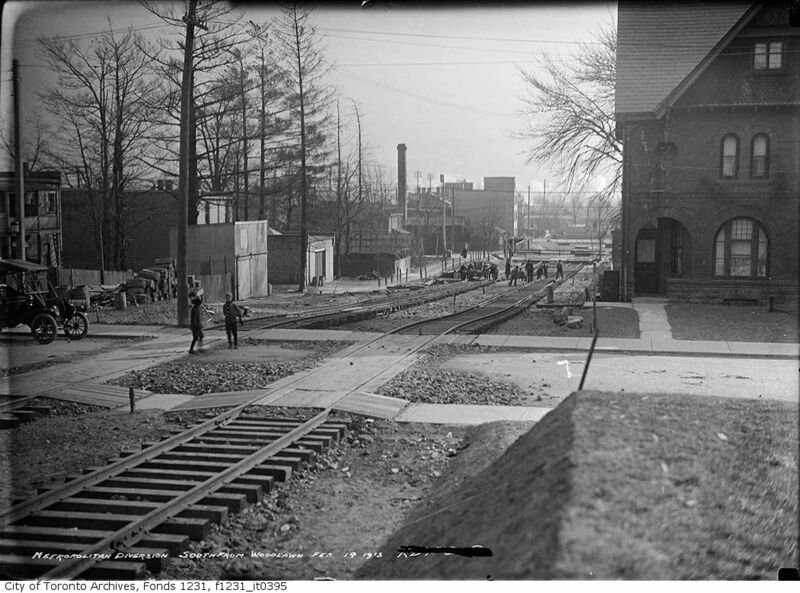 Star June 15, 1912 P6: ORB allows Metropolitan to come into the Toronto terminal on PRW beginning at Farnham and to be built 800′ to the west of Yonge, with grade crossings. The City is livid! Star June 27, 1912 P1: City and T&YRR may go to war over new Metropolitan PRW track: T&YRR was instructed by ORB to start work no later than July 10; the city may ask police to stop the work. Tely June 28, 1912 P21: Police at crossings to prevent work. 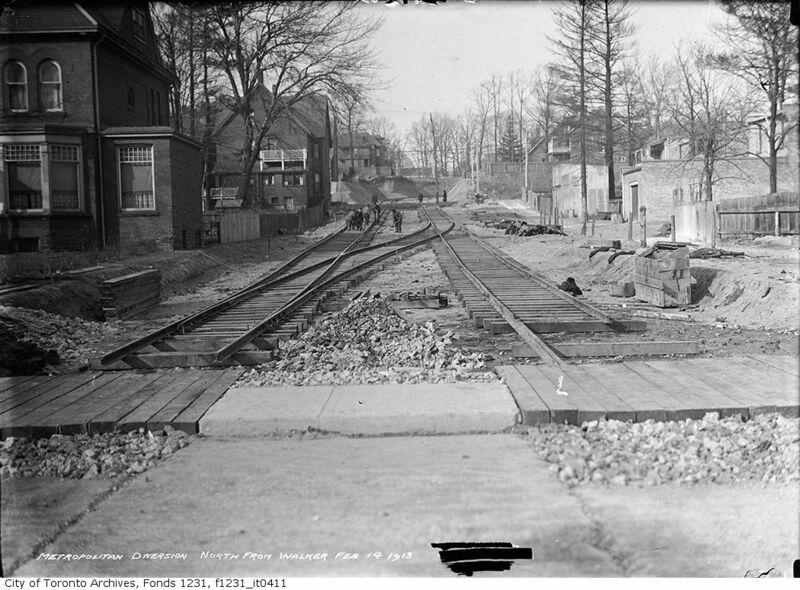 World July 8, 1912 P1: North Toronto rejects double track 815-332 but accepts annexation. (JFB Note: presumably the T&YRR were pleased as they didn’t want it anyway). Star July 10, 1912 P1: T&YRR begins to tear down two houses on their new off-street PRW, in spite of city-ordered police surveillance being in place to advise the city if T&YRR starts work on 120710 as required by the ORB. Star September 21, 1912 P2: Metropolitan PRW is proceeding; most property needed now acquired. 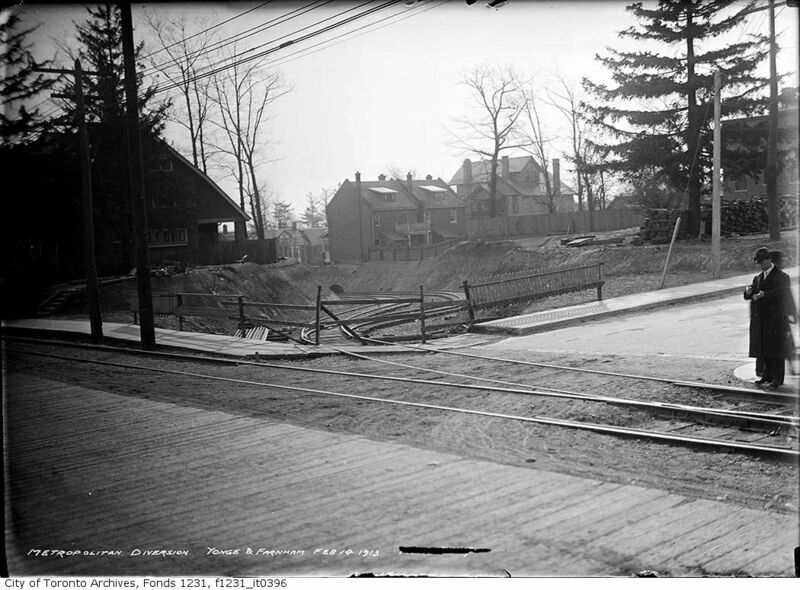 Star January 15 1913 P1: T&YRR case at Osgoode Hall upheld – T&YRR can lengthen their sidings and need not install double track in North Toronto. Star February 13, 1913 P1: City wins suit: T&YRR Metropolitan cannot deviate on the new line to North Toronto Station as the ORB order was overturned at Osgoode Hall. T&YRR is out $200,000 for the cost of the work done to date, and may appeal to the Privy Council. Star February 14, 1913 PP 1&2: R C Harris [this is the same person who was responsible for many public works in Toronto, and after whom the filtration plant at Victoria Park is named] and police force the T&YRR to stop work on the new deviation. T&YRR may continue work on the PRW but not on the street crossings. So far, rails have been laid to Walker and include a crossover north of Walker. 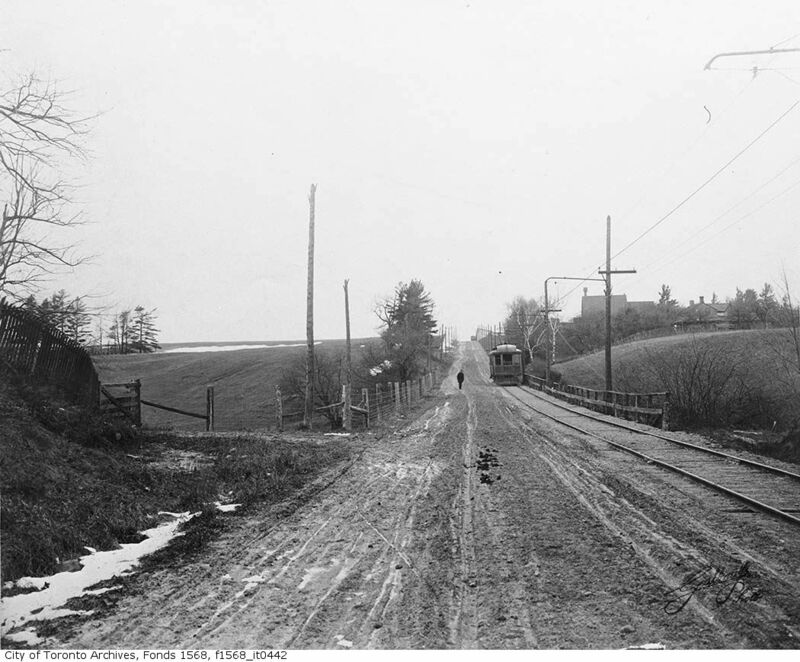 Star March 10, 1913 P14: T&YRR offers the city a double track on Yonge from city limits. If the city agrees, T&YRR is to offer to surrender their franchise if they can obtain running rights on the city line. Star April 5, 1913: P11 City and T&YRR can’t agree on Yonge double track; city had agreed to a double track, with MET running rights, but now T&YRR wants to own one of the tracks. My notes don’t include anything further. My recollection is that T&YRR lost their appeal at the Privy Council. John also directed me to photos of this diversion from 1913 in the City Archives. The terminal at Birch Avenue which is just north of the CPR tracks (ca. 1905). 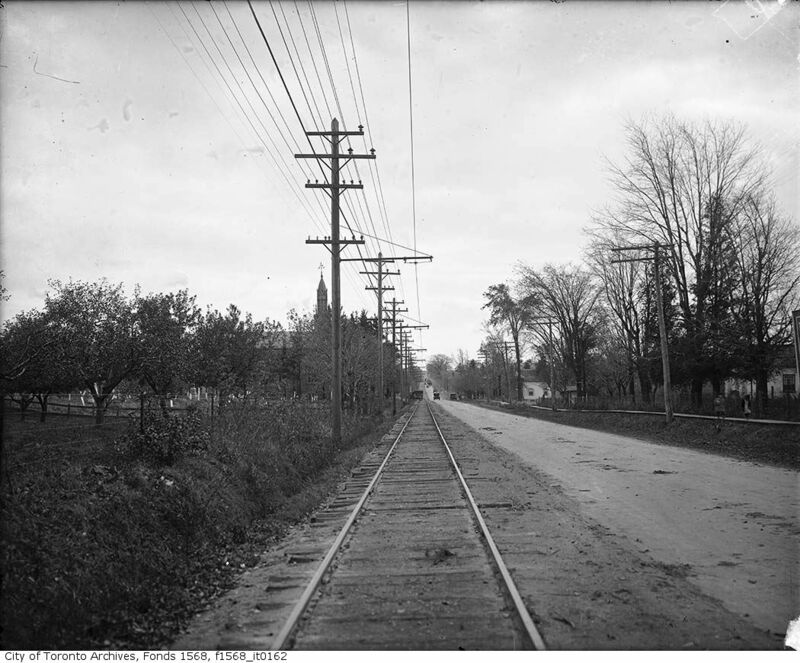 Looking south from 1/2 mile south of Finch’s Corner (Yonge and Finch) (1918). This is probably close to “North York Centre”. Thank you for the pictures. It’s fascinating to see how far the area’s backslid. Great old photograph’s! Dates please? Steve: I have added dates as shown in the Archives. My grandfather grew up in North Toronto in the 1920s and 1930s in the same neighbourhood that I did, just a couple of blocks north of where my family lived so it’s always interesting to see pictures from the early part of the 20th century and see what it was like around that period of time, to see what things were like when he grew up there. Granted, these events and the photographs are from a few years before his time, they’re still very interesting. Even more interesting is being able to speak with someone who lived in Toronto from the 1920’s to the mid ’50s and hear what it was like to live in the city and use the TTC back then from the perspective of an average (ie. not the same, tired everything was better in the past, the streets were paved with gold and Peter Witt cars were the be all and end all you get from railfans) person. Interestingly enough, the commute downtown in the late 1930’s took him about the same time as it takes me now. The difference being, walking out to the end of the street and catching a one seat ride down the whole way on the streetcar vs. a lengthy walk to one of the subway stations followed by a fast trip on the subway, balancing out the approximate times. I think the overall question about whether this is progress in general is quite debatable with specific issues going in different ways. Few people know that part of the Metropolitan Railway’s yard still stands. Tucked behind the buildings on the south-west corner of Yonge and St. Clair, stands the Badminton and Racquet Club, one of Toronto’s most exclusive private clubs. 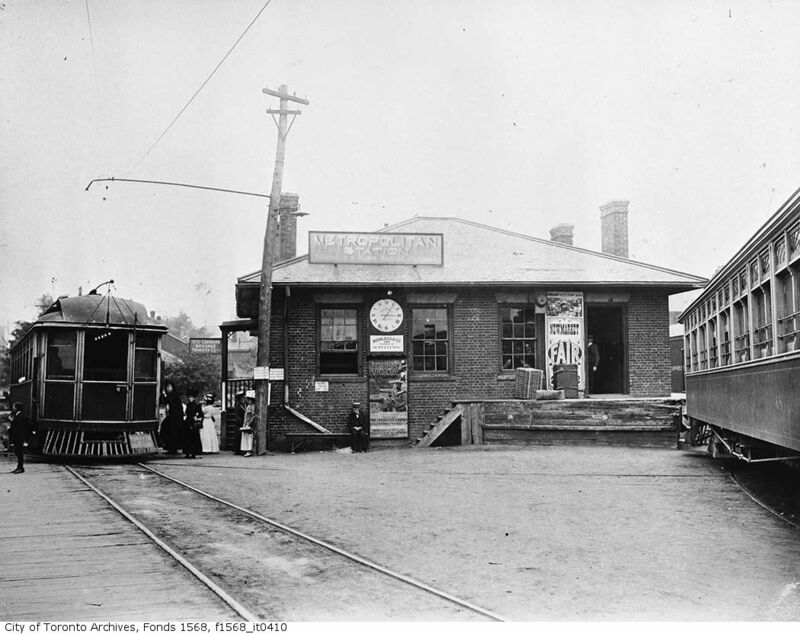 The club bought the former T&YRR buildings in the 1920’s after the TTC took over the line and started serving the Sutton Line from its Eglinton Yard. Steve: Are you sure that building is still there? I thought it was demolished for a recent condo. Fascinating site! A question . . .
My Yorkville grandfather married when he was 21 in 1895 – his occupation was noted as “trolley conductor”. Would he have been working on the Metropolitan Line? Steve: Possibly, or he might have worked for the Toronto Railway Company. Both the TRC and the Metropolitan existed at that time. The links no longer work but the photos can be found by going here, click on search the database, then enter Metropolitan Diversion in the search box. Thanks for this web page. I found the photos and was wondering about the story behind them. Steve: I have updated the links on this page to reflect the new standard URLs on the City Archives site.